Home > Corporate Greed, Kleptocracy	> Is 99% Spring Co-Opting Occupy Wall Street Into The Corporate-Controlled Two-Party System? 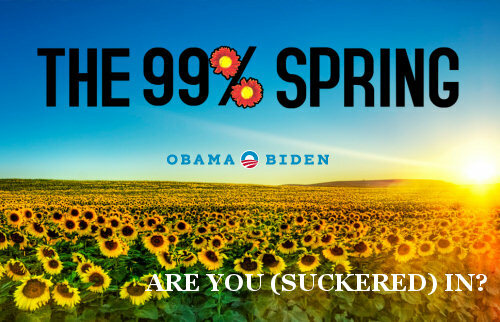 Is “Spring99%” a rejuvenation of Occupy Wall Street, or a false flag psyop aimed at absorbing OWS into the elite-controlled, false-choice Demopublican facade? IS THE 99% SPRING INITIATIVE AN ATTEMPT TO ABSORB THE OCCUPY MOVEMENT INTO THE CORPORATE-CONTROLLED TWO-PARTY SYSTEM? co-opt (verb): To absorb, assimilate or take into a larger group. See also co-opted, co-option, co-optive, co-optate, co-optated, co-optation, co-optative, coopt, coopted, cooptive, cooptate, cooptated, cooptation, cooptative, taken in, taken over, annexed, appropriated, subverted and screwed. This document may contain links shortened using http://tinyurl.com to facilitate emailing. If you are concerned we might use them to cloak phishing or malware, we recommend you open them with this: http://longurl.org. Also our thanks to the mobile web design, mobile web designer and mobile web developer that support our efforts.